The most important event in snooker, in terms of prestige and prize money, the World Championship commences at the Crucible Theatre, Sheffield on Saturday, April 15 and, as ever, promises to be a test of endurance as well as skill. 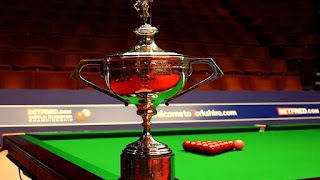 One player who has been fairly quiet is 2010 World Champion Neil Robertson, but ‘The Thunder from Down Under’ has looked on the way back in recent months, reaching the quarter-finals of the World Grand Prix, the Gibraltar Open and the Players Championship. The 35-year-old Australian has apparently set aside his computer games in favour of a more rigorous practice regime and, when in form, has the all-round game to beat anyone. He’s a noticeable absentee from this week’s China Open, so should arrive in Sheffield fresher than most and looks decent value at 12/1 with William Hill, Paddy Power, Coral or Betfair.